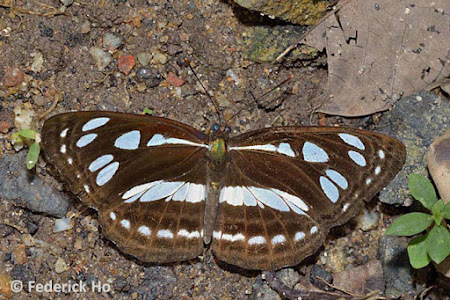 Amongst the black-and-white striped butterflies of the sub-family Limetidinidae, we showcased the Sergeant (or Athyma species) in an earlier blog article. 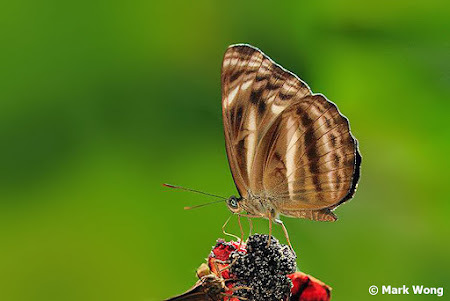 This weekend, we take a look at another group of butterflies featuring a similar striped look. Of these species, 3 are from the genus Neptis and one from the genus Phaedyma that have a 'zebra-striped' appearance. 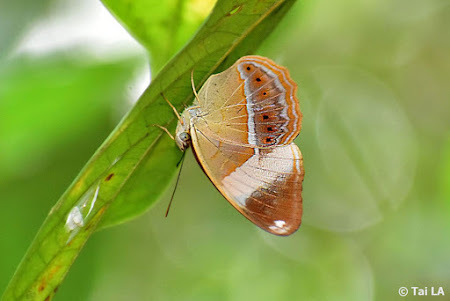 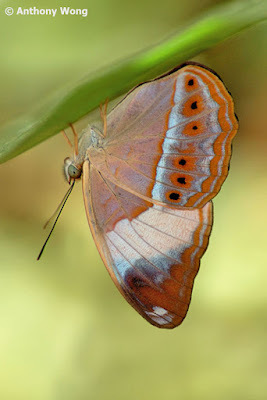 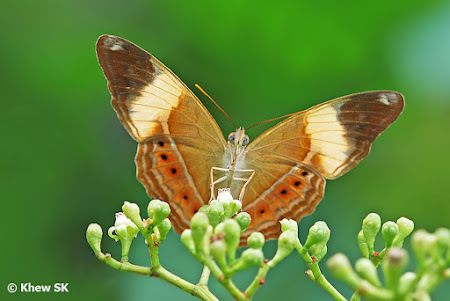 Collectively referred to as "Sailors", currently only 4 of these Sailor butterflies are extant in Singapore. These Sailors (also referred to as Sailers in some references), fly more gracefully than their cousins, the Sergeants (that, by the way, also "sail" as they fly, albeit more rapidly). 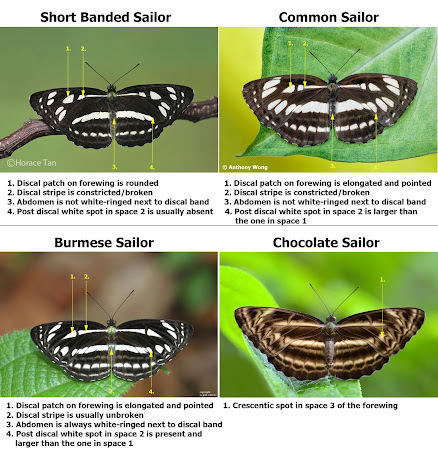 These Sailors tend to use the typical flap-glide-flap flight characteristic. They are, however, rather skittish and have a wide circle of fear that makes them hard to approach, unless they are distracted when feeding. Of the sailors found here in Singapore, three are black-and-white striped and the last one is dark brown-light brown striped and quite dissimilar to any other species found in Singapore. 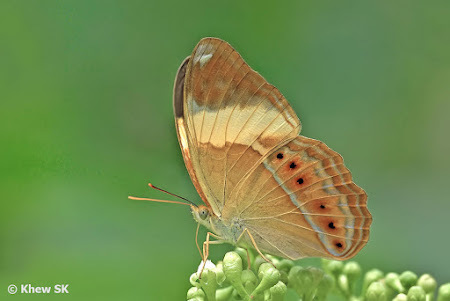 The sole brown-coloured sailor is also the least common of the four, preferring the forested habitats in the nature reserves. 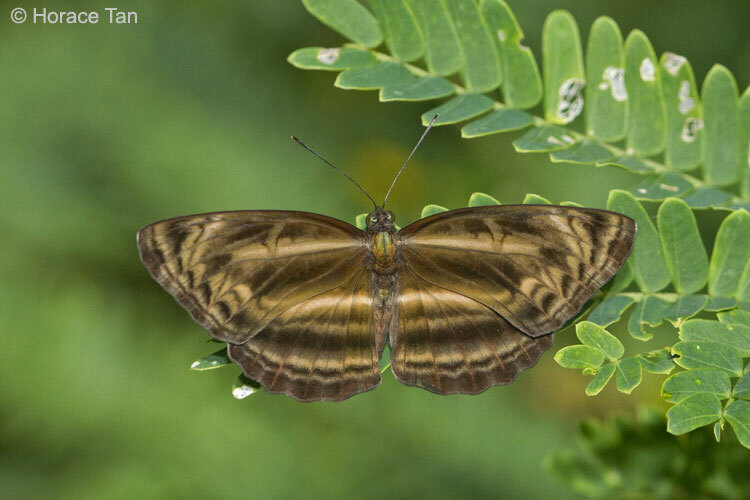 The first of the four Sailors to be featured is placed in a different genus from the other three species of Sailors. It is the only representative of its genus Phaedyma in the region. This black-and-white Sailor is considered common in Singapore, and is widely distributed, from the forested areas to urban Singapore in parks and gardens. 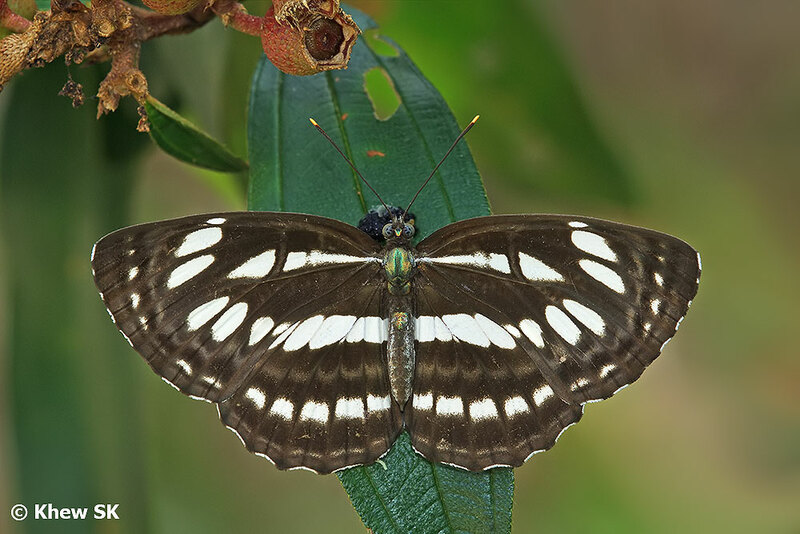 Sporting its graceful gliding flight, the Short Banded Sailor can often be observed flying at treetop level, stopping to sunbathe with its wings opened flat amongst the foliage amongst roadside shrubs and trees. 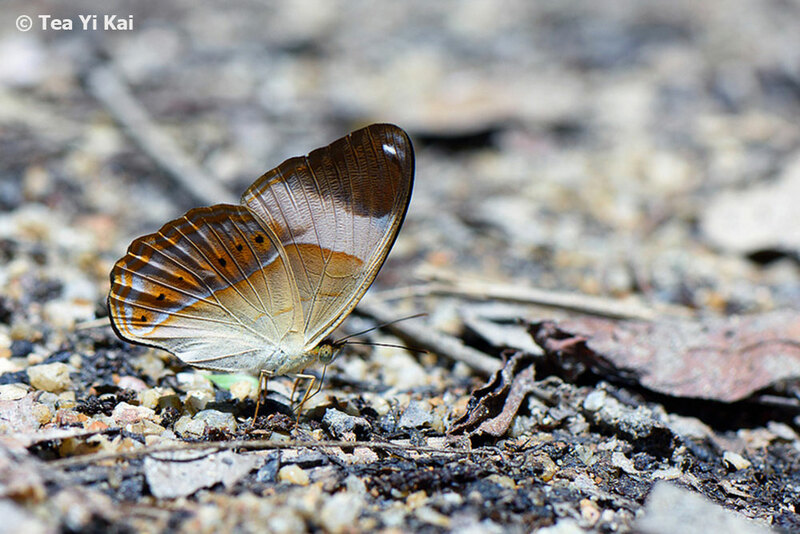 It is skittish, and when alert, is hard to approach. 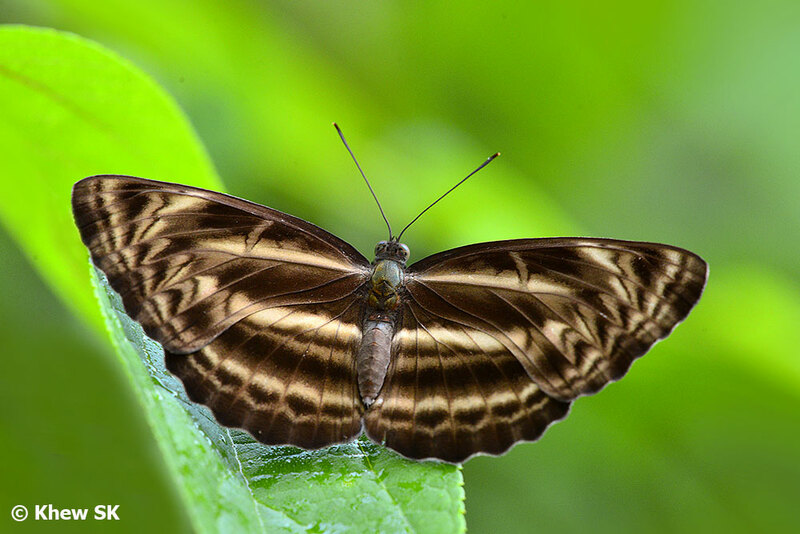 The triangular discal patch on the forewing is rounded and not elongated. The post-discal white spot in space 2 at the dorsum of the forewing is usually missing, but where it occurs, much smaller than the spot in space 1. 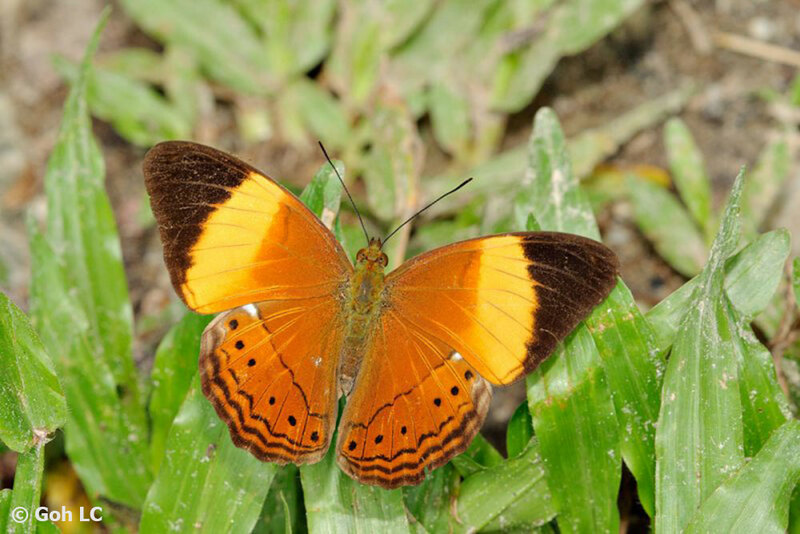 Underside is deep orange-brown and the hindwing discal band does not reach the costa. Underside of hindwing, the white discal band not prominently outlined in black. 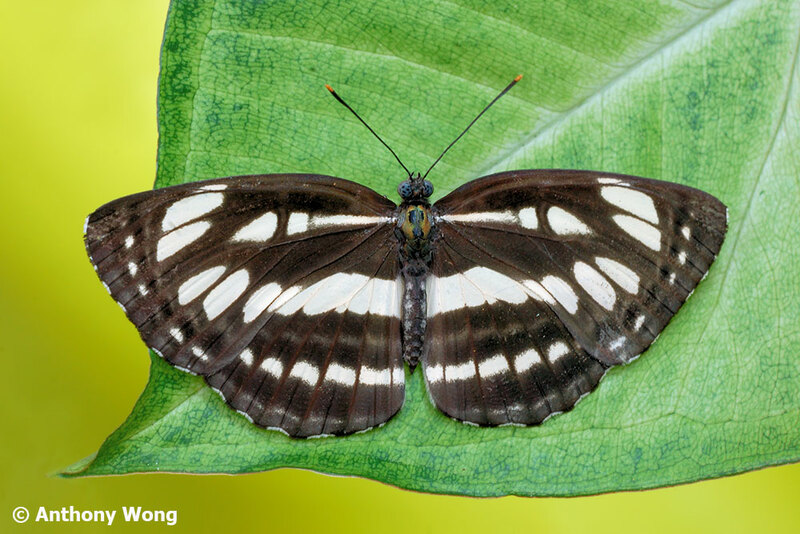 The Common Sailor is the first of three species of the Neptis genus that is extant in Singapore. It is relatively widespread in distribution, and can be found in urban parks and gardens as well at the fringes of the nature reserves. 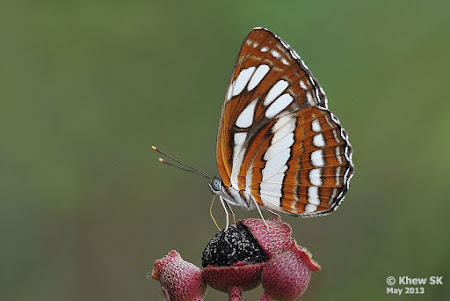 It is moderately common and can usually be observed flying singly amongst shrubbery, and resting with its wings opened flat. The upperside is black-and-white striped, with the discal stripe on the forewing with a subtle "break". The underside is a rich golden brown and on the underside, the white discal band is prominently outlined by black lines. 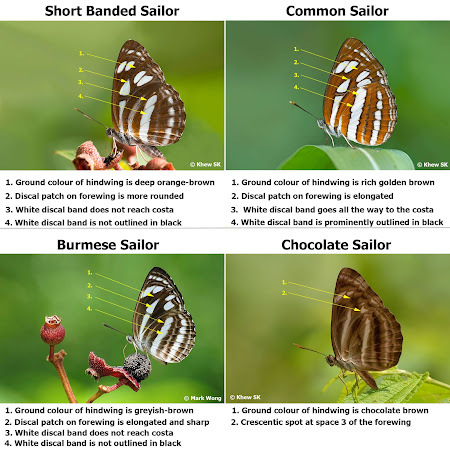 The triangular discal patch on the forewing is usually more elongated and sharper than that of the Short Banded Sailor. 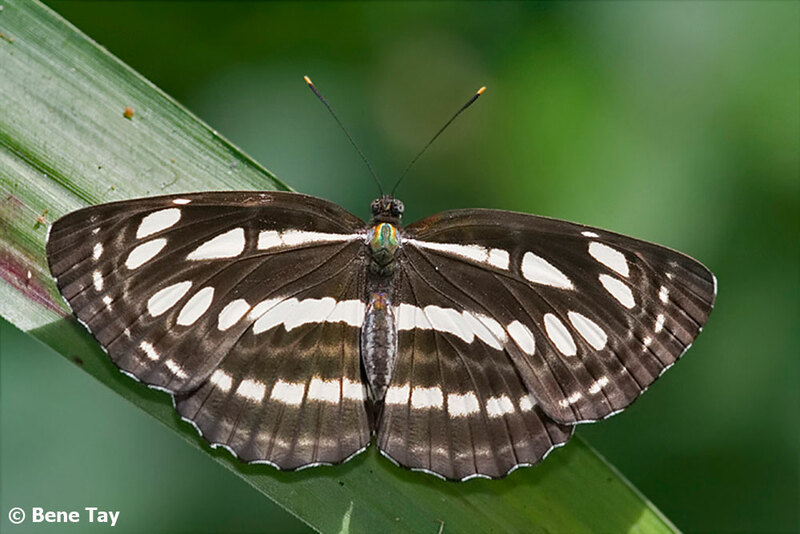 The post-discal white spot in space 2 at the dorsal edge of the forewing is always present and much larger than the spot in space 1. Underside is rich golden brown and the hindwing white discal band reaches the costa. Underside of hindwing, the white discal band is prominently outlined in black. 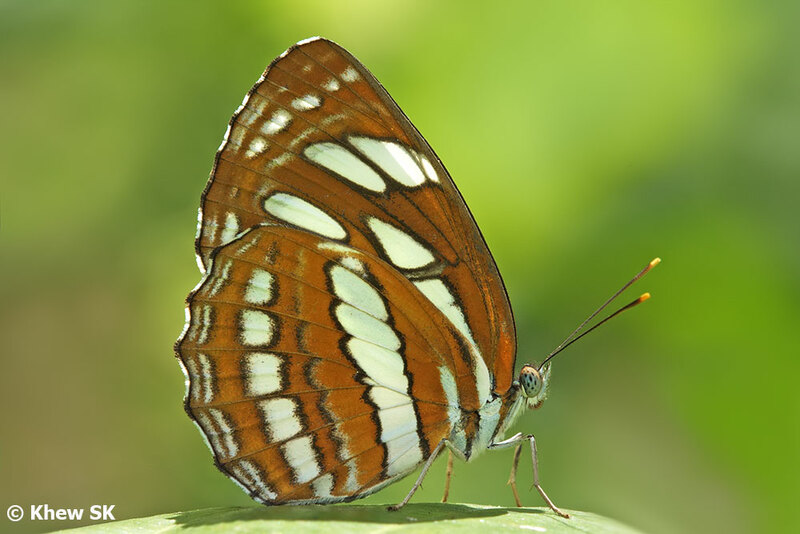 On the upperside, the abdomen is not white-ringed adjacent to the white discal band on the hindwing. 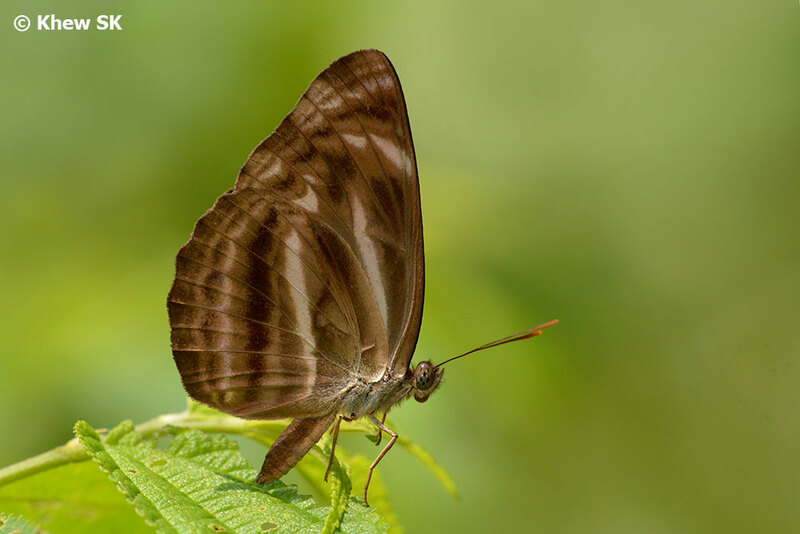 The Burmese Sailor (formerly called the Grey Sailor in the 1st edition of Butterflies of Singapore), is a predominantly forest-dependent species. 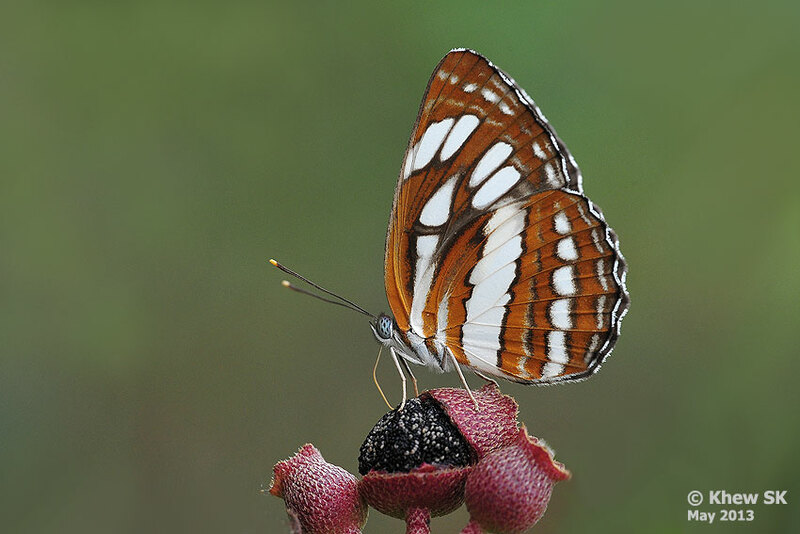 It is relatively common in locations where its caterpillar host plant, Gironniera nervosa can be found. 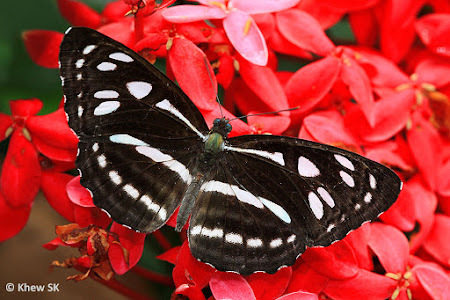 The species is rarely seen in urban areas. 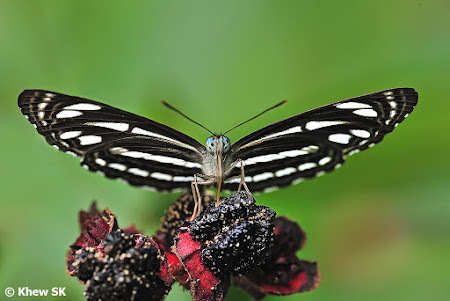 The Burmese Sailor sports the same black-and-white striped appearance like many of the other Sailor butterflies. 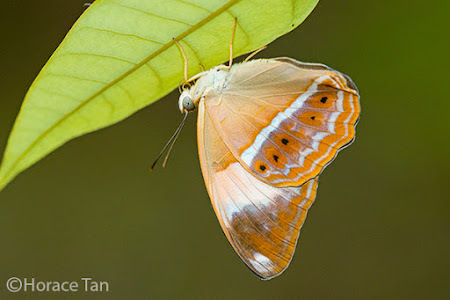 On the underside, the base colour is greyish brown and is quite unlike any of the other Sailor species in Singapore. 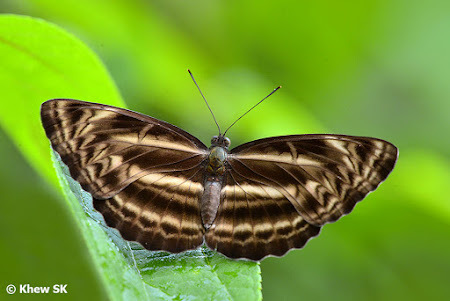 The Burmese Sailor's flap-glide-flap flight is typical of the genus and it is usually quite skittish and not easy to approach without spooking it away. 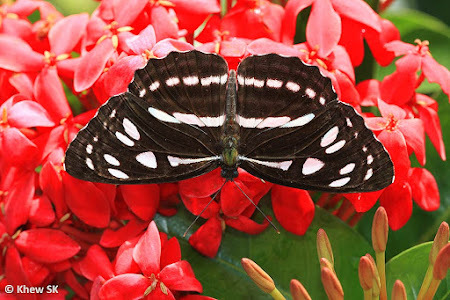 The triangular discal patch on the forewing is long and elongated, ending in a sharp point. 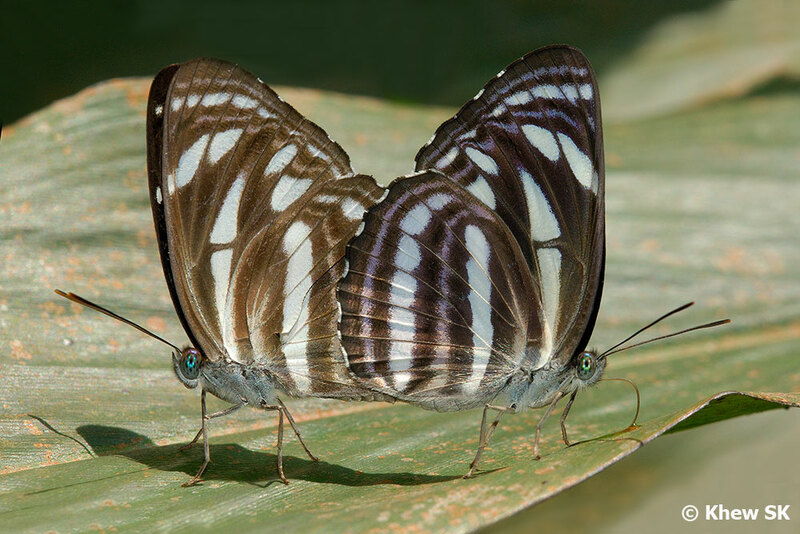 The discal stripe is usually unbroken. Underside base colour is greyish to greyish-brown and the hindwing discal band, which is not outlined in black, does not reach the costa. 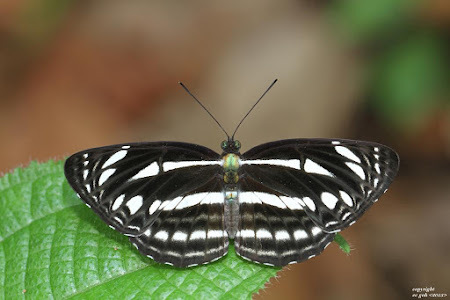 On the upperside, the abdomen is white ringed adjacent to the white discal band on the hindwing. 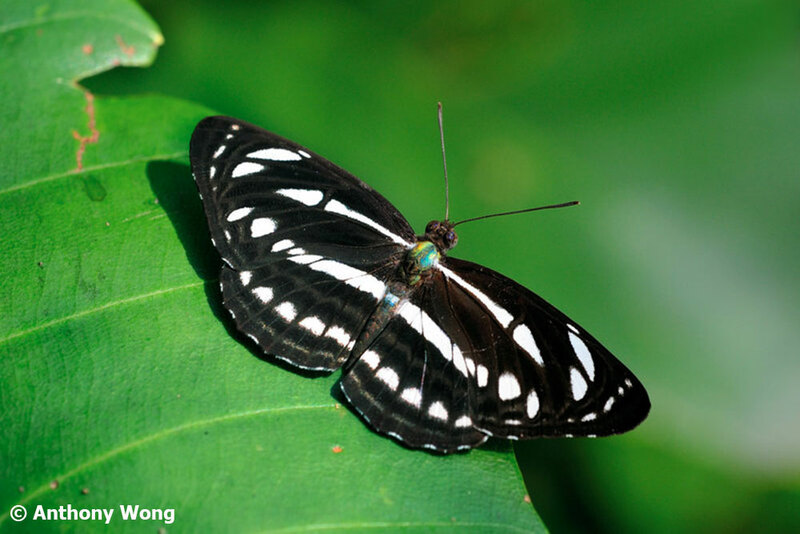 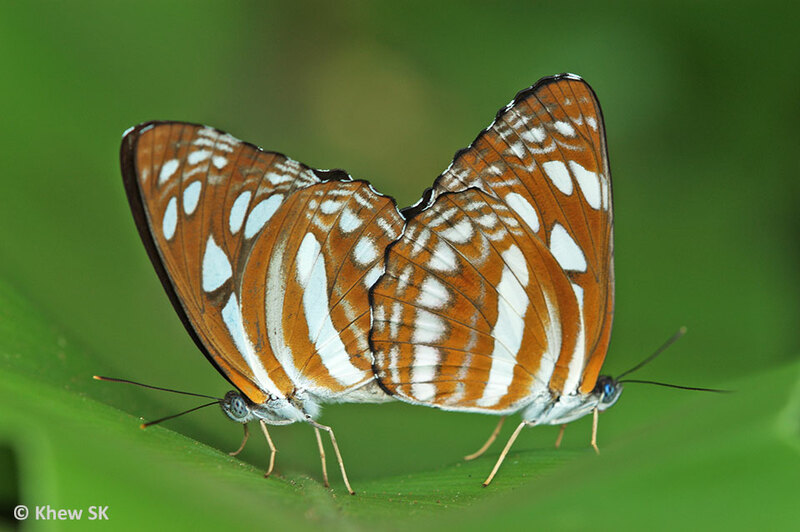 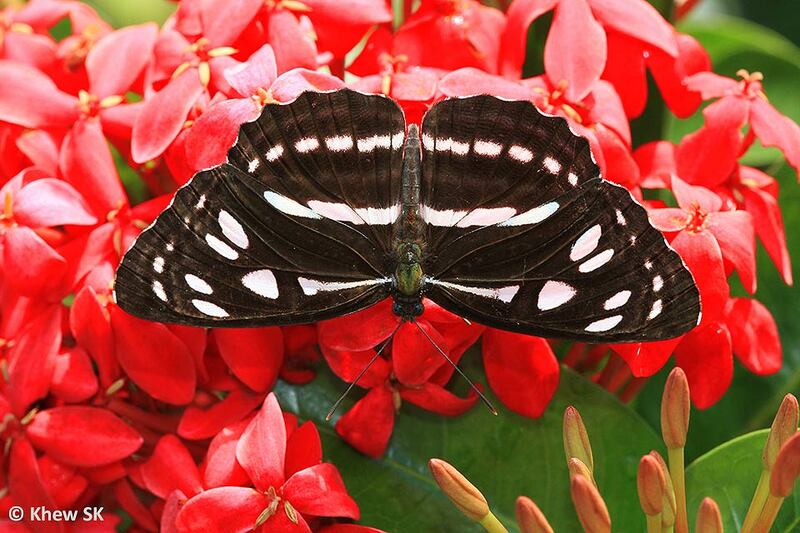 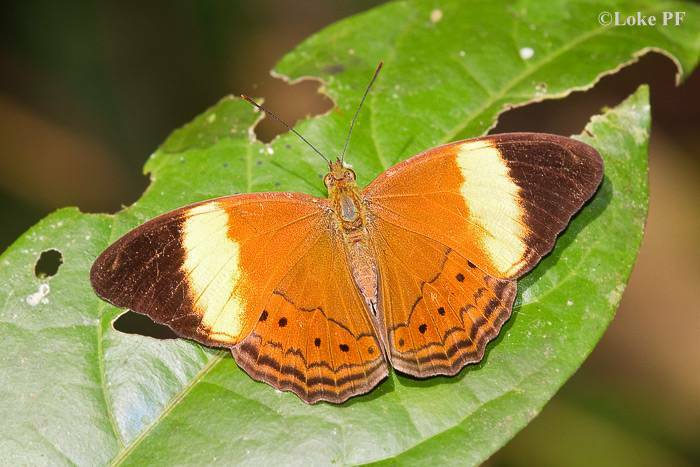 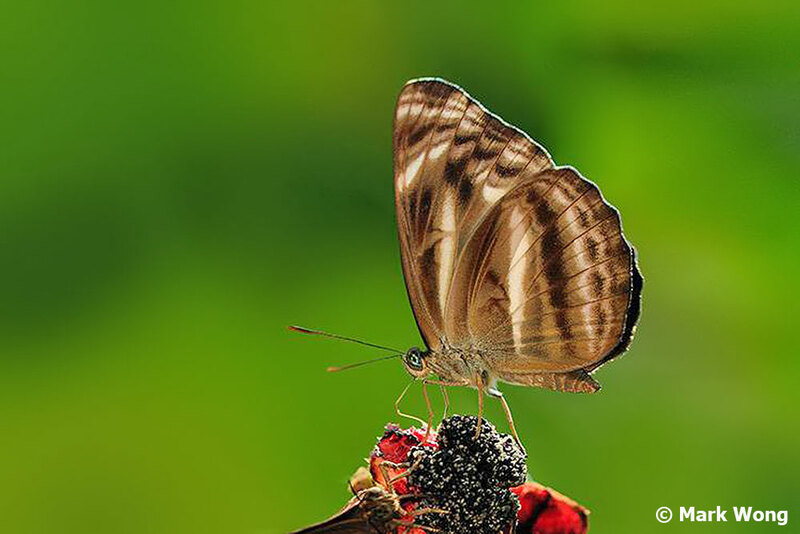 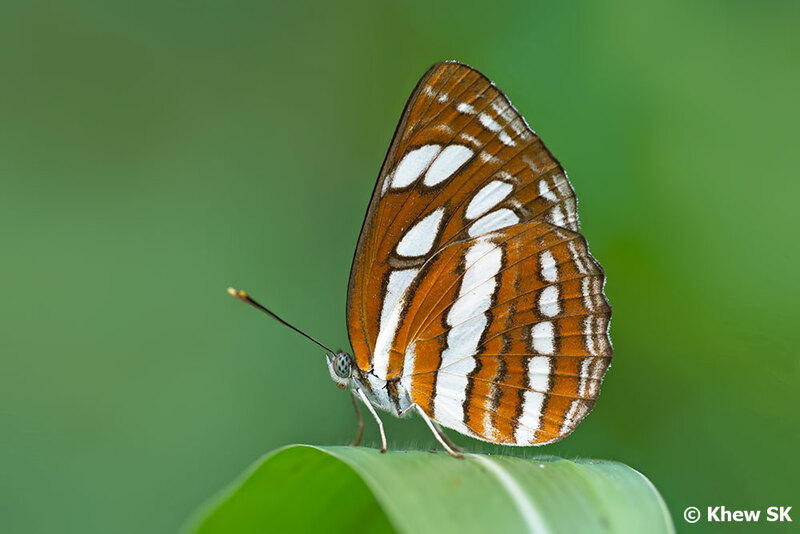 The last of the Sailor butterflies found in Singapore is distinctly different from the other species in that the black-and-white stripes are replaced with dark and light brown. 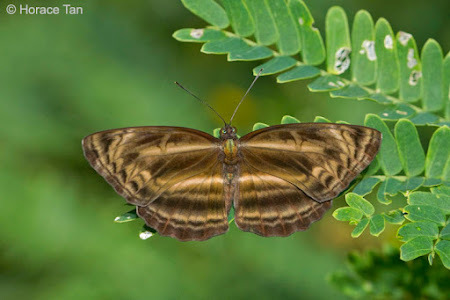 Despite the similar striped appearance, the brown stripes are obvious enough that this species is unlikely to be confused with any of the other Sailor species in Singapore. 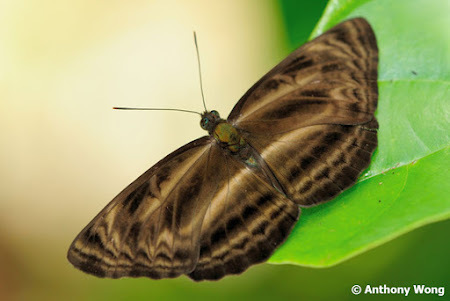 The Chocolate Sailor (also called Dingiest Sailer in some books) is rare and is usually found in the forested areas within the nature reserves of Singapore. 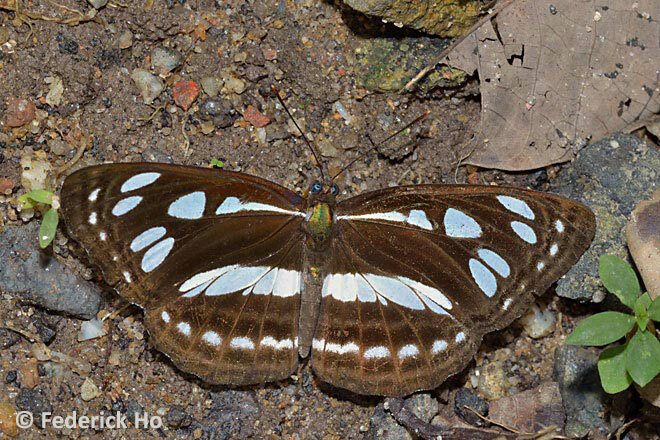 It was recorded as a new discovery for Singapore when it was first spotted in the early 1990's in the Mandai area. 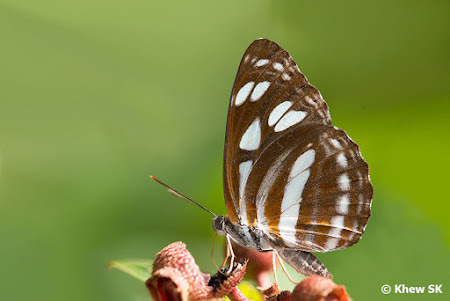 The butterfly is dark brown with lighter brown stripes across both wings. 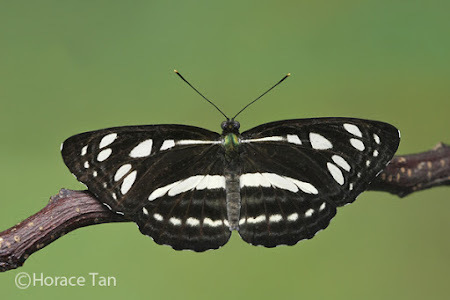 The distinctive crescent-shaped post-discal spot in space 3 of the forewing sets it apart from the other brown Sailor species that are found in Malaysia. 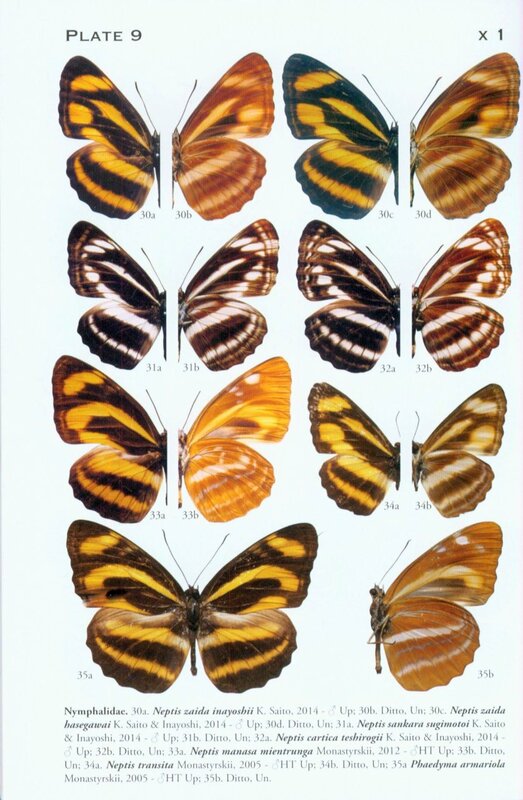 Dark brown/light brown striped appearance, instead of the usual black-and-white stripes. 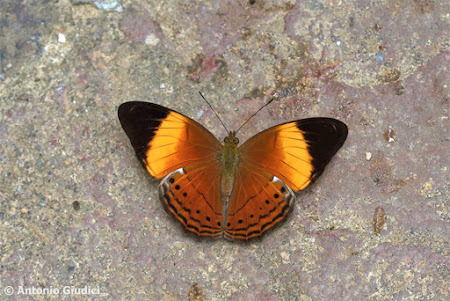 Post-discal spot at space 3 of the forewing is crescent shaped. Underside is slightly paler, but also with a brownish base colour. There is a total of 15 other Neptis species that can be found in Malaysia, and it is quite possible that one or two of these lookalike species may appear in Singapore in the future. 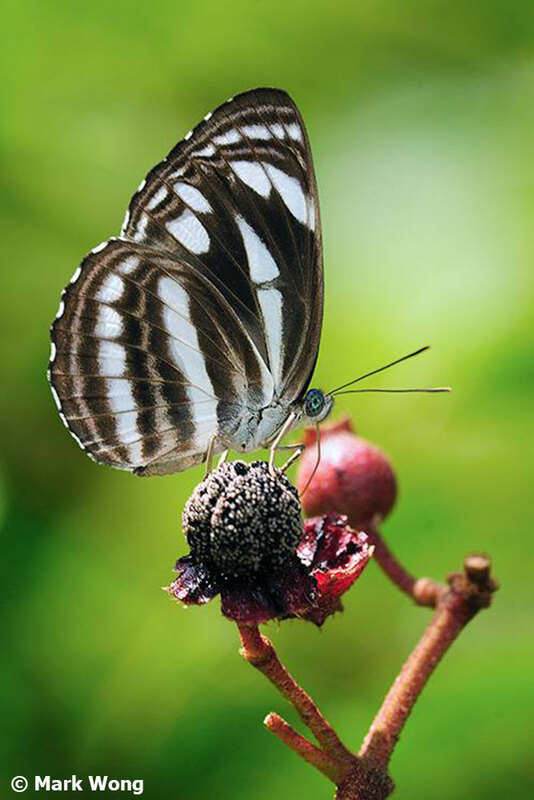 With these basic identification tips on the four that are found here, do look out for any future discoveries that may appear on this little island one day! 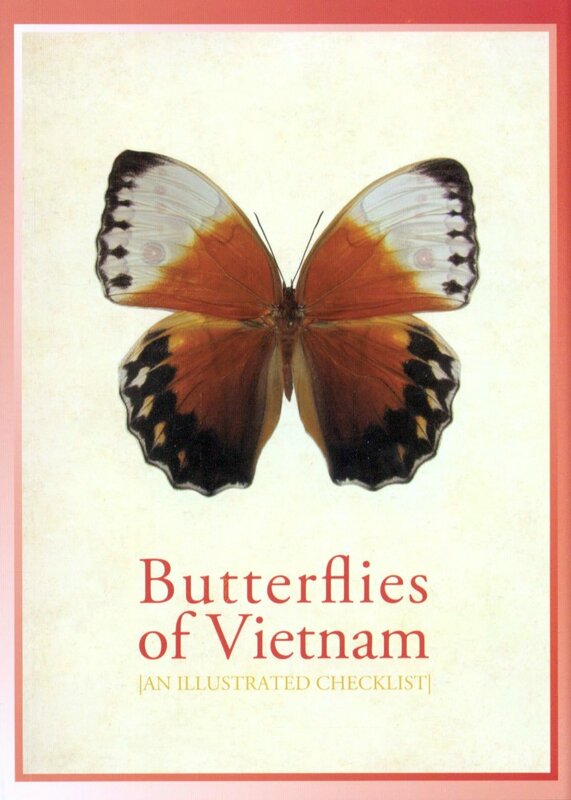 A recent business trip to Ho Chi Minh City (formerly Saigon) in South Vietnam led me to a local bookshop near the hotel where I stayed. 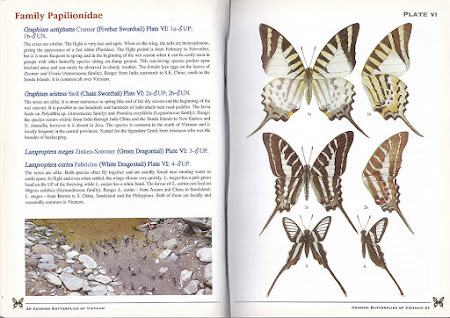 Whilst browsing around the nature section, I wondered how many books I would find about the local butterfly fauna of Vietnam. The shop did not stock any, although there were quite a few other books about birds, flora and landscapes of Vietnam. Of the 10 ASEAN countries, relatively comprehensive hardcopy literature on butterflies can be found for Malaysia, Thailand, Philippines, Laos and Singapore. The remaining ASEAN countries are Myanmar, Cambodia, Brunei Darussalam, Indonesia and Vietnam. 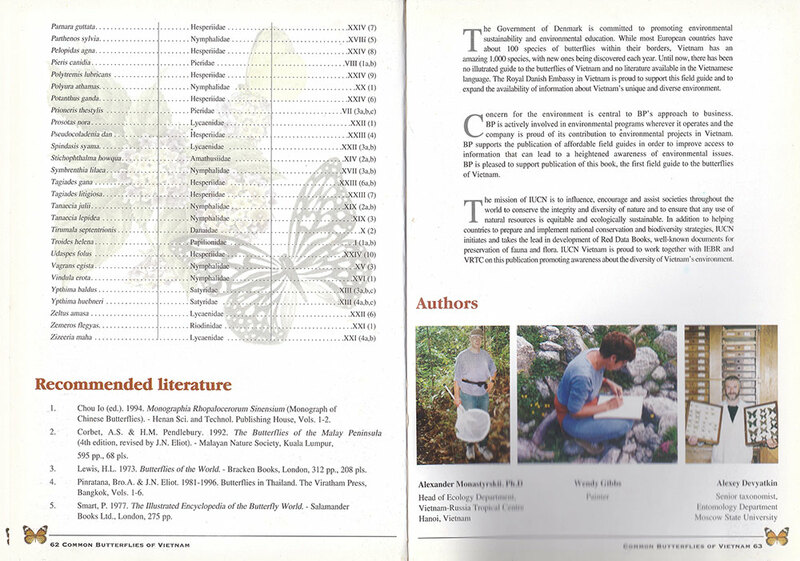 There are basic guidebooks and many work-in-progress books for the majority of these countries. Amongst all the books available, Pisuth Ek-Amnuay's 944-page Butterflies of Thailand Vol 2 stands out as the largest comprehensive work on Thai butterflies. 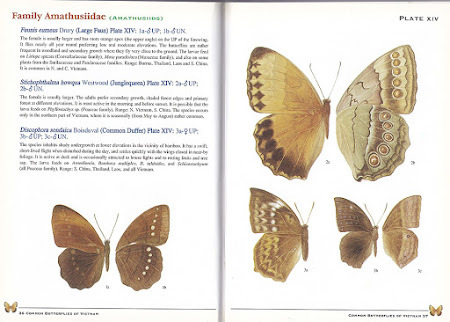 A quick search online for books on the Butterflies of Vietnam showed that there are a couple of basic 'illustrated checklist and field guide' type of books, and a few more comprehensive work in progress. Most were authored by Dr Alexander Monastyrskii, a Russian entomologist, in collaboration with several other co-authors. 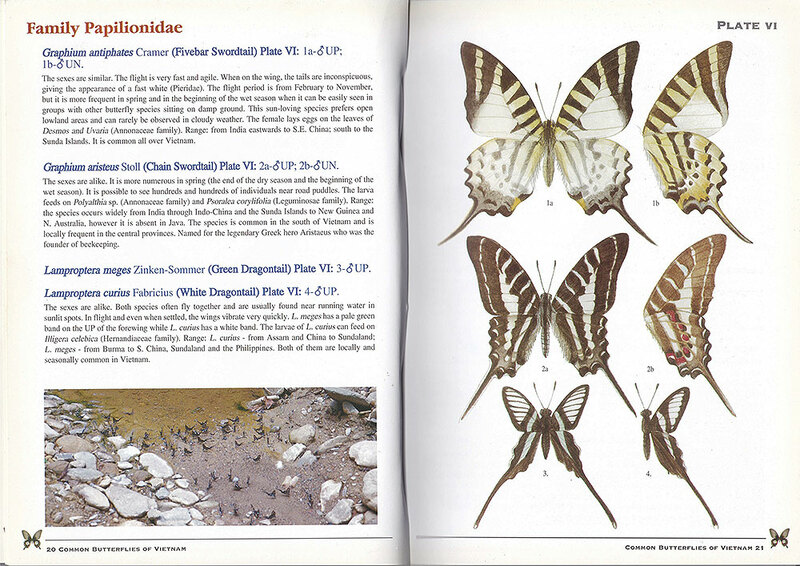 A basic Field Guide on the Common Butterflies of Vietnam, published in 2002 is touted as the "first illustrated field guide to the Butterflies of Vietnam". This 63-page field guide, featuring 105 of the common butterfly species in Vietnam, showcases hand-drawn illustrations of butterflies. 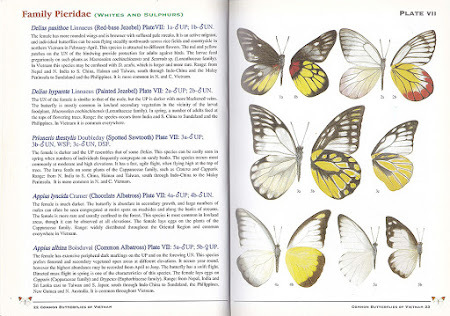 These drawings by artist Wendy Gibbs, are very accurate drawings of the actual butterflies from a set collection. 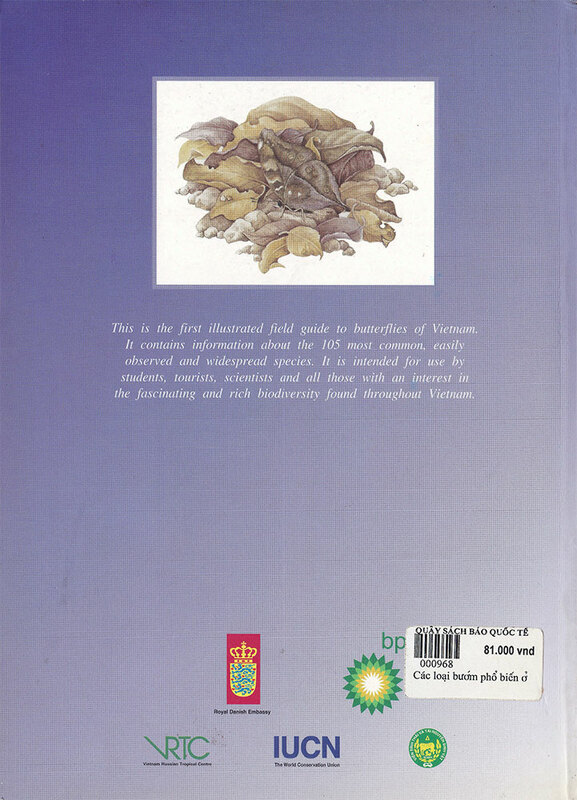 The book opens with a foreword penned by Mr Nguyen Minh Thong, the IUCN Country representative, and Prof Vu Quang Con, the Director of the Institute of Ecology and Biological Resources in Hanoi. 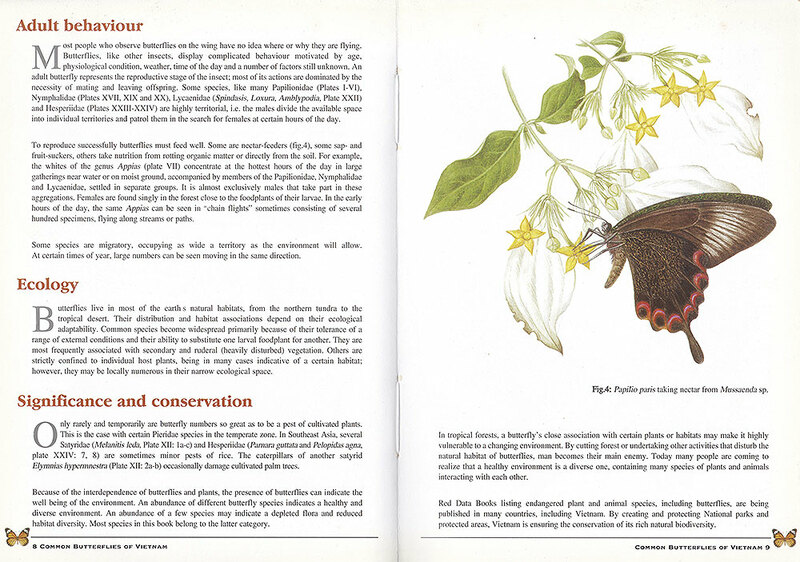 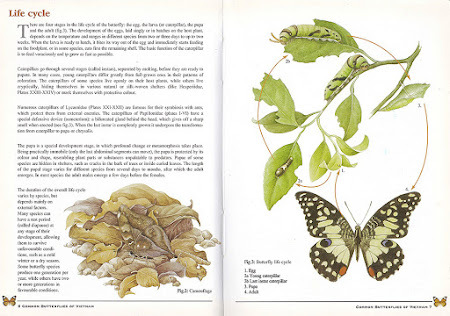 Like the majority of butterfly books, the first six pages dwell with some basic information on classification, morphology, life cycle, behaviour, ecology and conservation. 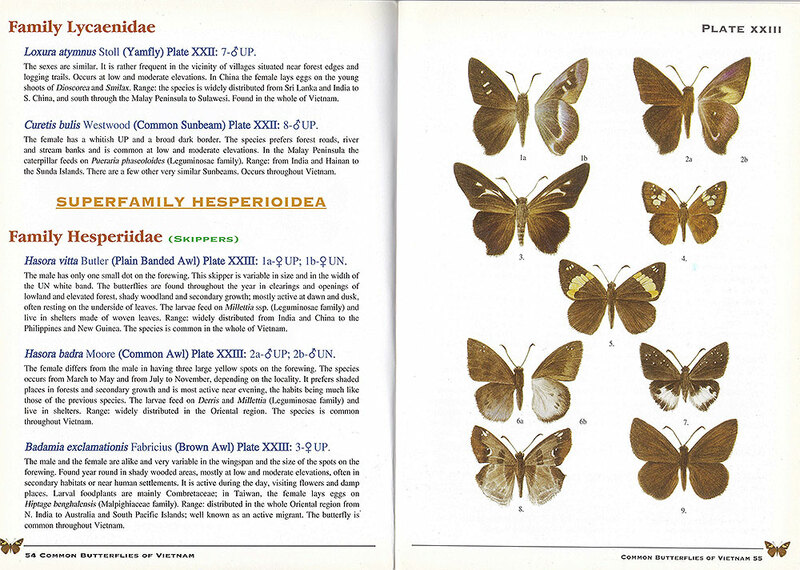 Having probably been worked on in the late 1990s and early 2000's the authors used the old taxonomic classification prior to the more recent consolidation of several families into Nymphalidae., this does not really detract from the value of this basic field guide in helping to identify common butterflies found in Vietnam. 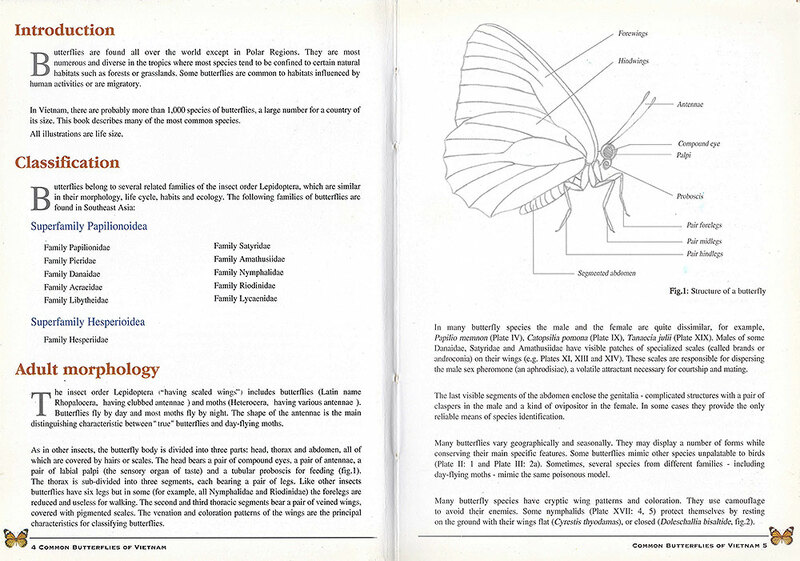 The species pages are organised in a very simple format with the scientific names stopping at the species level. English common names are also given, and are generally quite consistent with many of the books available on ASEAN butterflies. 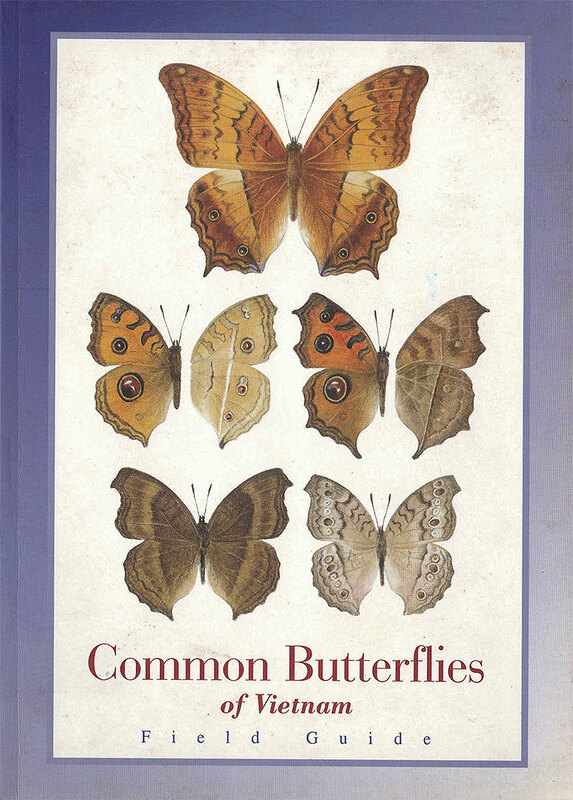 For example the Neptis species are called "Sailors" in this book, as opposed to "Sailers" that are used by other authors. 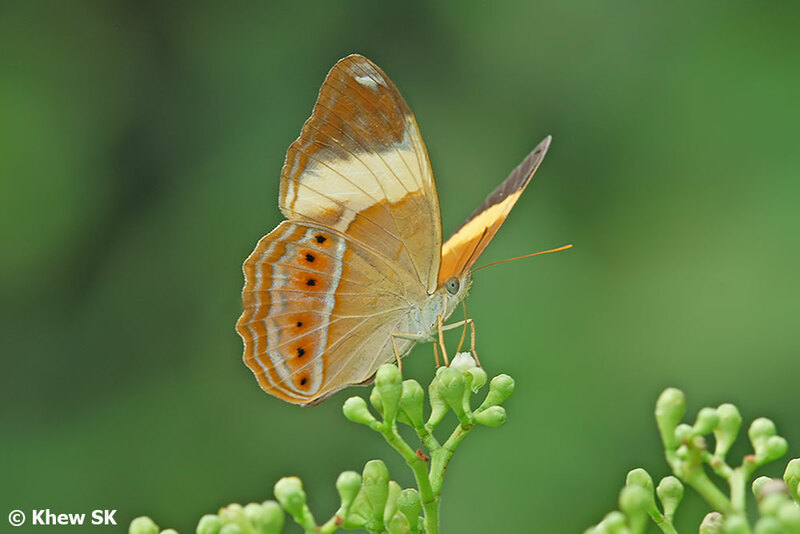 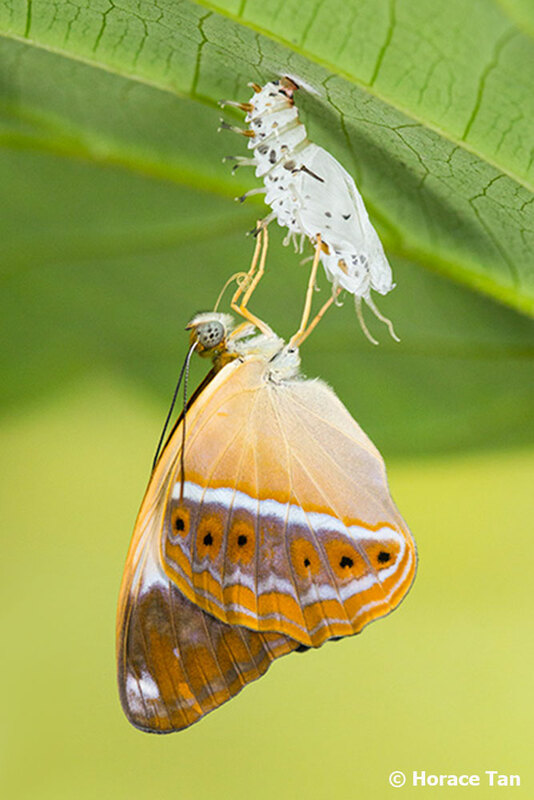 Each species has a short write-up, describing the butterflies' behaviours, differences between the sexes, favourite nectaring plants and geographical range where the butterfly occurs. 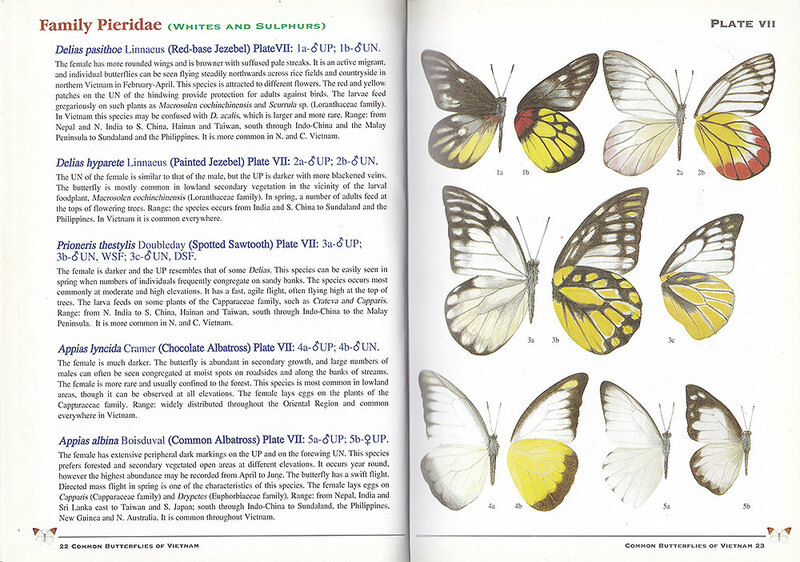 For some of the species, upper and underside or male/female illustrations are shown, using the half-butterfly depiction that is used in WA Fleming's Butterflies of West Malaysia and Singapore. 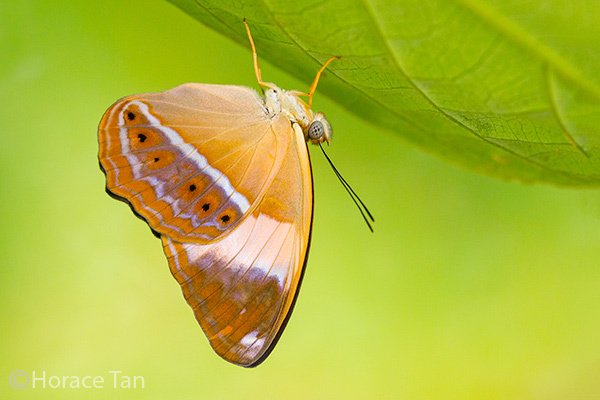 Given the small number of butterfly species featured - 105, which is less than 10% of the total number of species found in Vietnam, a reader will quickly look for more comprehensive books about Vietnam's butterflies. The good news is that there are several updates by the same author available. 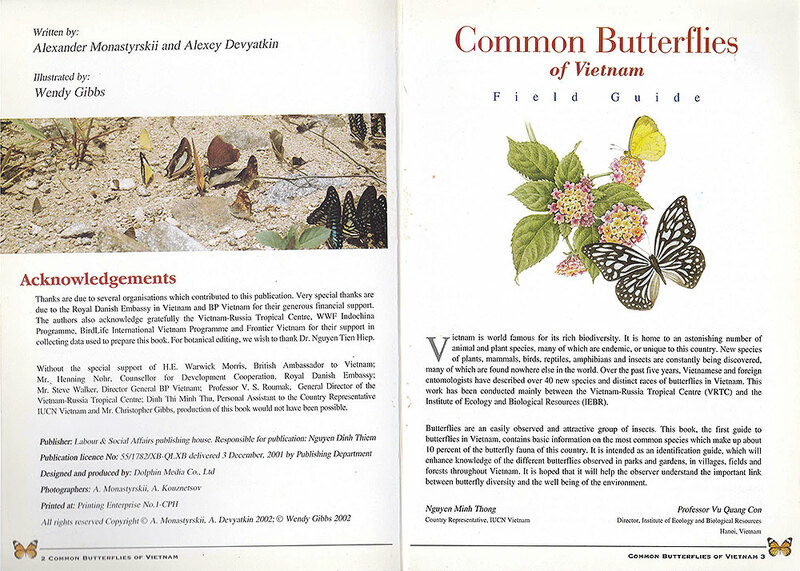 An example is the 114-page 2nd edition of the Butterflies of Vietnam: An Illustrated Checklist published in 2016. 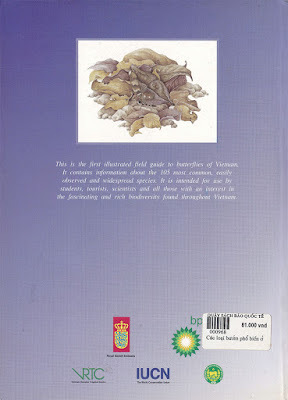 These are more comprehensive books showing a wider collection of the species found in Vietnam and I am sure that more volumes will be available in due course. 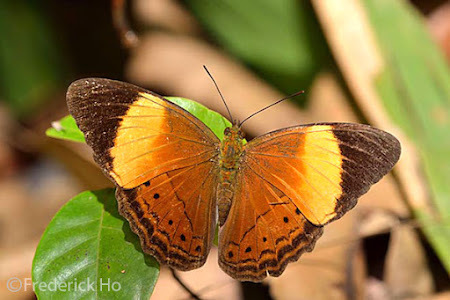 For the more serious students, a scientific paper on The Biogeography of the Butterfly Fauna of Vietnam With a Focus on the Endemic Species (Lepidoptera), by A.L. 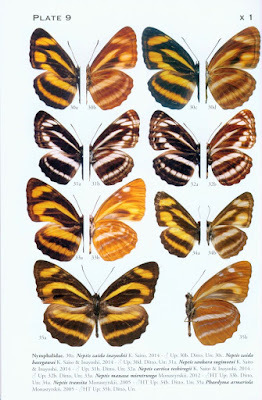 Monastyrskii and J.D. 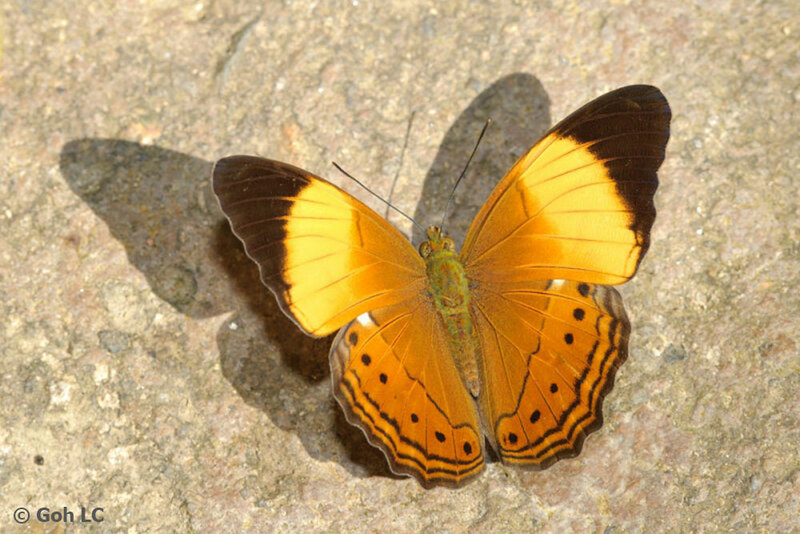 Holloway, is also available. This paper discusses the biogeographic distribution of Vietnamese butterflies, featuring several key endemics found in Vietnam. So for butterfly watchers who visit Vietnam, do check out these books for your reference to help you to identify what you have seen in various parts of this biodiversity-rich ASEAN country. 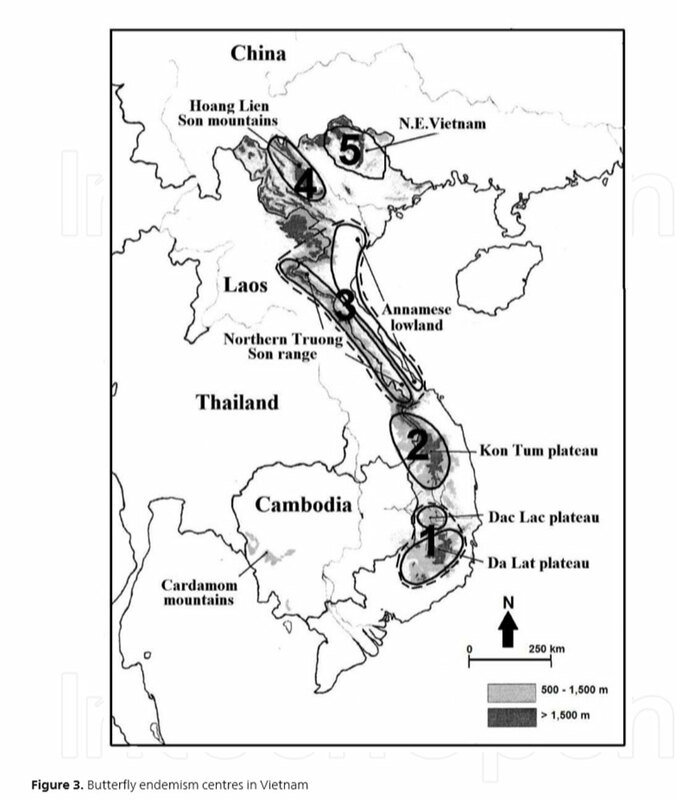 Vietnam is a large country covering a total of 331,230.8 km2 of land mass and has a long coastal line. 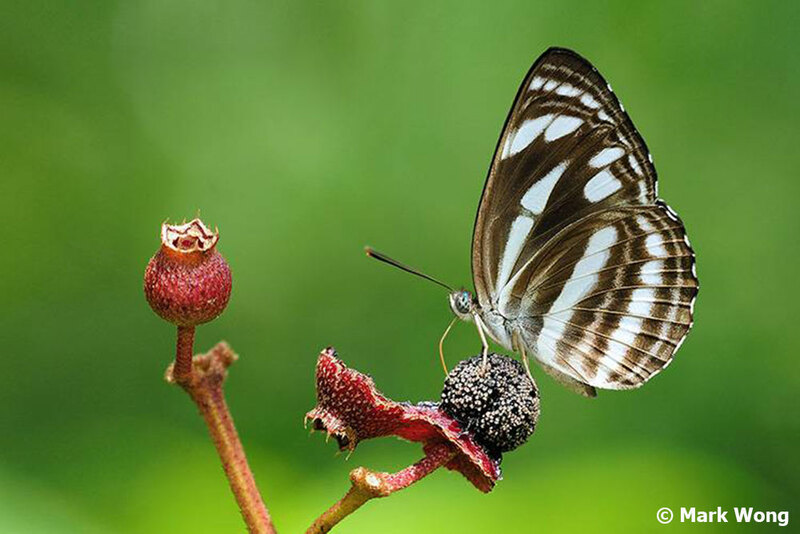 The current number of species recorded is 1,181 and counting. Photo plates from the books are copyrighted property of their respective authors and publishers, and samples of the pages from the books are featured here under the principles of fair use.